Cards Against Humanity science pack: Helping support women in STEM. I am very pleased to let y’all know that the ridiculously fun and grotesquely crass game Cards Against Humanity has released an expansion science pack of cards I helped develop. And better yet: Sales of the pack go toward a full-ride scholarship for women seeking undergraduate degrees in science, technology, engineering, and math! 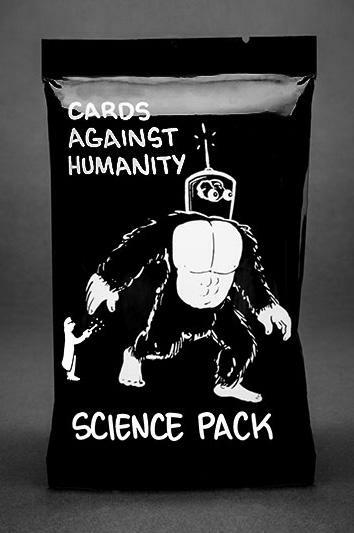 The science pack is available on the CAH online store. Let me be absolutely, positively, vacuum-of-space clear here: This game is massively and completely and utterly NSFW. It’s very much only for adults. The official game motto is, “A party game for horrible people” and that’s the only thing about this game that’s not a joke. The game is incredibly offensive, a hard R rating for sure, hugely over-the-top on purpose. I’m sure a half-dozen psychology theses could be written about why it’s so popular, but popular it is. Millions have been sold. Having said that, this part is amazing: 100% of the proceeds from sales of the science pack will fund scholarships for women seeking STEM degrees (CAH put out a press release about this). And we’re talking full-ride scholarships here. The applications will be reviewed by a panel of more than 40 women, professionals with advanced STEM degrees. The thinking is that this panel will also provide a network that can help support the scholarship recipients. I think that’s a fine idea. As of the time I posted this article—just a few days after sales began—well over $230,000 has been raised by sales of the pack! Wow. Seriously, wow. My involvement came through my friend Zach Weinersmith, who creates one of my all-time favorite Web comics Saturday Morning Breakfast Cereal. He asked me to be a judge for a science humor competition he was putting on called BAHFest, and not being a fool of course I said yes. He said that he was making some giveaways for the audience, and wanted to create a special science pack addition for CAH. Would I be interested in coming up with some funny cards? Yes again. We met with the CAH folks via Google Hangout, whipped up a few hundred funny ideas, trimmed them down to a few dozen (oh my, that was very, very hard to do), and then finally settled on what’s now in the pack (my favorite: “Failing the Turing test”). So here’s your chance. Are you a terrible person? Then you can also be a great one and help a young woman—or several—get started with a career in investigating the Universe.